Welcome to our oversized one bedroom. Our unit is larger and has more light than most other one bedrooms. We have a sliding glass door to the balcony and another wall with windows which give you great views of Mary Jane and the new Winter Park Village and skating rink. We have easy access to both the elevator and the washer and dryer, which will come in handy to dry your clothes after a big powder day. Starbucks is right in the same building what a great way to start or end your day. Come and relax we will make it as comfortable for you as we can. Ask us about discount tickets. Great time at ZML as always! Pam’s unit is located at end of hall, which is great! - ski locker located end of aisle near bench! Liked Pam’s place and recommended! Loved being so close to the slopes! Just a short walk to the gondola, and first time (in some 25 years at winter park) we have stayed in accommodations that we did not need to drive to a lot or walk to a bus stop. Great having the ski locker on the first floor. Bummer to pay $16 a day to park, but we didnt need the car most of the stay. Pam's unit was great, the couch very comfortable for sitting and as a pull out for sleeping. A few instructions would be helpful as the remotes do not power on the TV, you have to power it at the TV itself and then the remotes work to change channel or volume. The DVD player is blue-ray which would be good to list in the amenities. I cook dinner and we eat breakfast each day, and with 4 of us, we needed to run the dishwasher each day. More cereal bowls needed. There are only 6, so sometimes needed to use soup bowls where a smaller bowl would do. Not enough mugs! There were no potholders, so I used two dish towels to remove pans from ovens. I guess other people eat out more. Did not like the $59 fee for deposit insurance which could not be avoided. We usually fix things during rentals and never break anything. We are mechanically talented and have fixed toasters, electrical, etc in many units. Rather pay a refundable deposit. Nice place though and bed was comfortable. No issue with the laundry next door, we never heard noise from it. Pam was easy to reach and responsive. Our sons are both over 6 ft and no issues with either the pull out or the supplied airbed. It worked great and did not lose air during the night. No bureau in the master was odd, but we used the night stands for clothing storage so we could get the luggage stored away in our car- no room in the unit to store luggage for 4 of us. We loved our 8 nights and would rent this unit again. I am glad you enjoyed your stay. I wanted to let you know I have already replaced oven mitts in the condo, right after your stay when a renter informed me they didn't find any. This is the first time I have heard of a shortage of bowls and mugs so I am putting 6 more of each in there this weekend. Thank you for letting me know! Great unit; plenty of ammenities and space for a one bedroom. Very clean and well kept. Everything in the unit and as part of the lodge was what we needed. Plenty of everything in the condo and very accommodating owners for early entry. Location has big pluses and one minus: Since the location is on the corner of a business walking/drop off area, there is some noise early in the morning that woke us up (and we get up early). The location also means we were steps from restaurants and shopping which was nice. The only reason for 4 star vs 5 was the early morning noise. Spacious condo. Two adults and two kids (14 and 10) and there was plenty of room. Master Bed was comfortable and kitchen was well equipped (dish soap, dishwasher det, napkins, papertowels, trash bags, salt/pepper, etc). Plenty of extra sheets, blankets and pillows. Condo gets hot quickly (even with heat turned down) but we used the fan and opened the balcony door to cool off. Pam was fantastic to work with and always answered questions immediately. 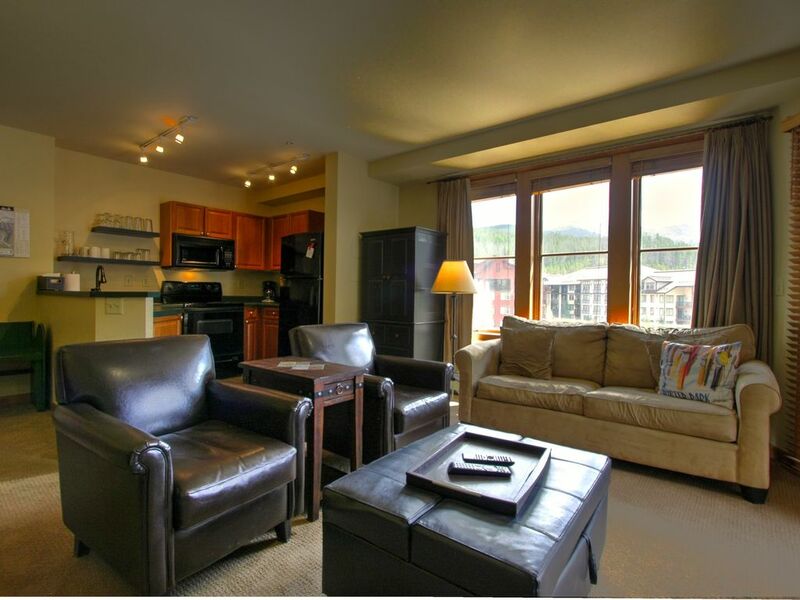 The condo is a short walk to the slopes and the ski locker was a plus! Even though the corner unit is located next to the laundry room and overlooks the ice skating rink, we found it to be quiet. I would certainly recommend this unit for anyone visiting Winter Park. Condo is very clean with easy access to the lifts. It has an amazing view of Winterpark Village from the deck. The extra bed was small, but comfortable and plenty long for my 14 year old son. Excellent choice.